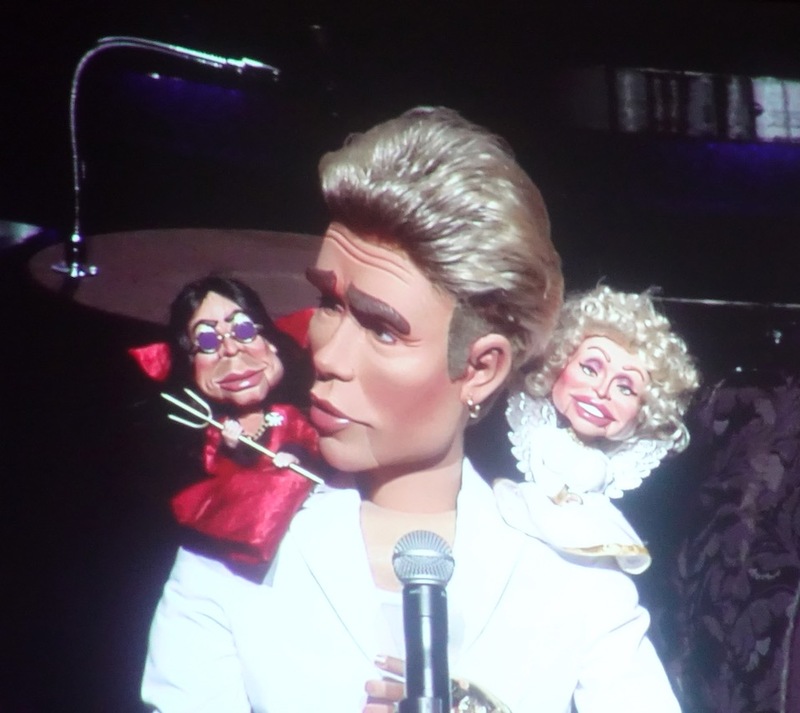 Three of Terry Fator’s puppets: Justin Bieber, Ozzie Osbourne and Dolly Parton. I was lucky last Thursday. A friend invited me to accompany her to see Terry Fator at the Mirage Resort & Casino. I had seen Fator before, but this was the first time in several years. Fator is celebrating 10 years on the Strip, having performed for more than 2 million people. He says his current show is the soundtrack and story of his career. As we were leaving the theater I heard a man say, “This show was better than the last time we saw him.” I had somewhat of a different opinion, though I must admit, I was still quite impressed that Fator can be so many characters, male and female. I didn’t count the puppets, but there were plenty of them; brought to the stage quickly by assistants. Lots of song parodies are part of the action, with words helpfully shown on overhead screens. Jokes and laughs were frequent. The audience particularly reacted to a couple jokes that involved current news items. A few seats on the side of the Terry Fator Theatre were unoccupied, but to me, the crowd looked quite good. I had a special view because sadly, I arrived 10 minutes late for the show, having had it in my mind that the show started at 8 p.m. I walked down a long aisle to my seat, fortunately, on the aisle. 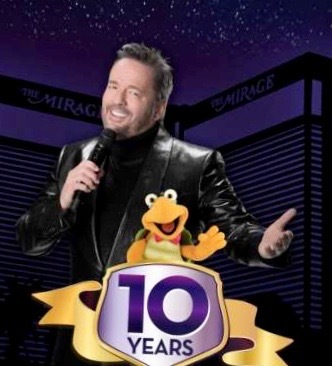 The start time last Thursday was 7:30 p.m.
Terry Fator chose Winston, the impersonating turtle, to be with him on his 10-year poster. Fator’s show is now much slicker than I remember. His assistants work with precision. The seven piece band knows exactly when to start and stop the music. The show was so fast-moving that I wanted a bit of the “old” Terry Fator where he had a show girl assistant and he reached into a large box to find new puppets. The old shows had a more spontaneous feel which Fator can handle. (A night later, I attended a new show at Alexis Park featuring Kelly Clinton and Elisa Fiorillo. I bet everyone in the audience can remember the unplanned and spontaneous “lost eyebrow” incident and the humor that followed.) On the other hand, if one didn’t like a particular impersonation at Fator’s show, the audience waited just minutes for a new puppet and voice to appear. My friend told me that early in the show a Donald Trump puppet made an entrance io great applause and lots of movable hair. My own favorite puppet is Vicki the Cougar. She’s an old-timer in the show, but her racy dialog is always fun. One thing about the show that I did like was a rather long introduction of each of the musicians on the stage and later, videos of all the cast members assisting Fator. Videos play a major role in the show, occasionally featuring photos that are a punchline to an on-stage joke. Fast paced might be an understatement, but it was a good show!